Instant jQuery Selectors: My first book is out! Today I’m really pleased to announce that few days ago my first book, titled Instant jQuery Selectors , was published by the Packt Publishing. Publishing a book has always been one of my goals since I started my developer career, and now that I realized it I can’t explain how I’m happy. I really hope anyone who has the same dream will realize it. Said that, it’s time to be more concrete and write something about the book. 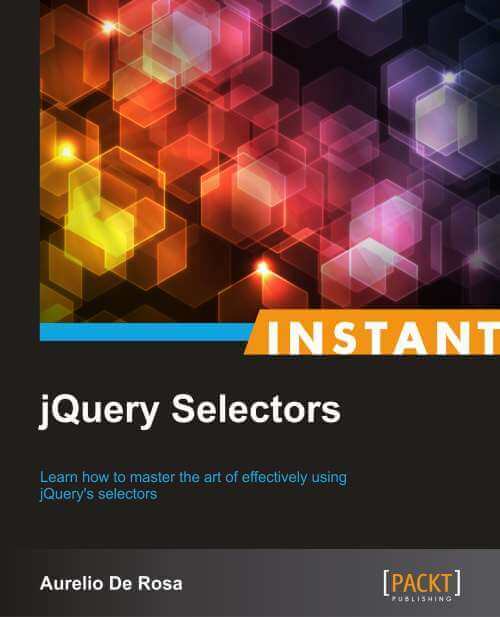 Instant jQuery Selectors is a practical guide that will teach you how to use jQuery’s selectors efficiently in order to easily select the elements of your pages to operate upon with jQuery’s methods. You will go through the most common problems that you could face while developing your project and will learn how to solve them with the help of focused examples that Instant jQuery Selectors has to offer. Instant jQuery Selectors is for web developers who want to delve into jQuery from its very starting point: selectors. Even if you’re already familiar with the framework and its selectors, you could find several tips and tricks that you aren’t aware of, especially about performance and how jQuery acts behind the scenes.